Ski resorts cope with lackluster snowfall every year by making their own. A LOT of it. But up until now, the cost and design of such “mammoth” snow blowers kept availability out of reach for those of us simply “dreaming of a White Christmas.” The Backward Blizzard changes all that and for a price that is very affordable – about the cost of your average tax refund. 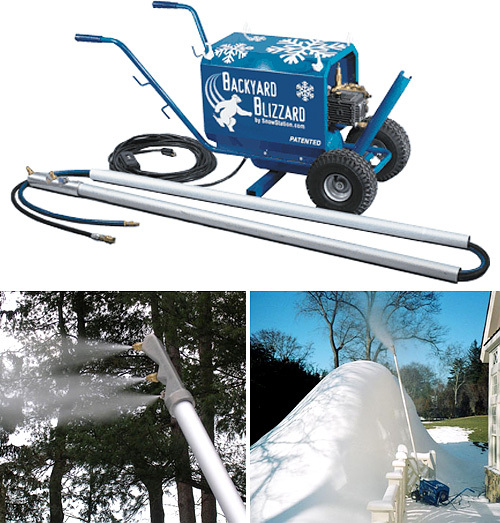 The Blizzard Sport model is extremely portable, which allows users to cover an entire front and back yard at about 50 cubic feet of genuine snow per hour, thanks to its 1.5 hp aircompressor and high-pressure water pump. Users just plug the Backyard Blizzard into a standard 20-amp electrical outlet, hook up a garden hose and pray for a cold winter day so kids can have a great day of sledding, snowball fights and making Frosty. Cost is about $2,400 plus another $289 for shipping. Unfortunately though, those looking to get one will have to wait until “next year,” as the Backyard Blizzard is already sold out for 2007. Oh man, I so want that. Too bad I live in Southern California where a 25 degree day lasts about 10 minutes between 4-5am!